trustinghana | Follow Tom's work with Engineers Without Borders in Ghana! 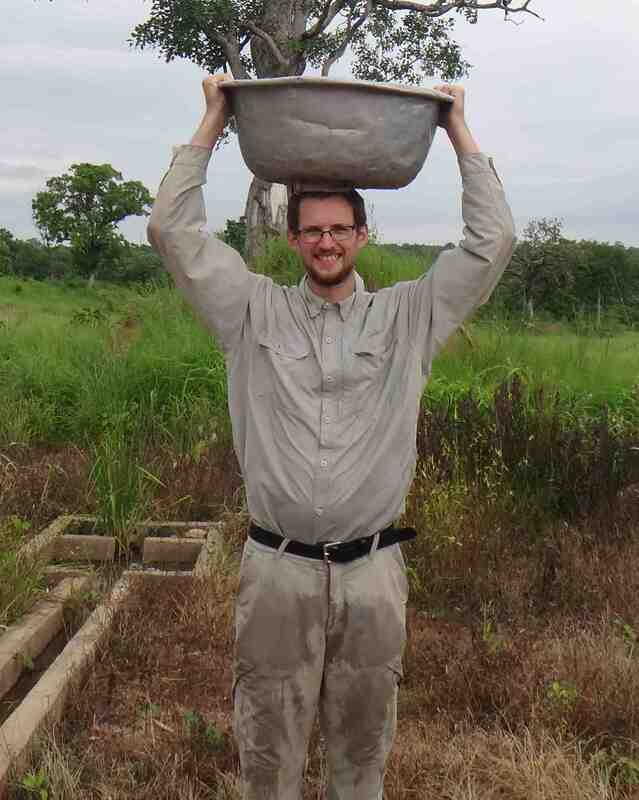 Follow Tom's work with Engineers Without Borders in Ghana! Happy New Year! Christmas marked the 4 month anniversary of my return from Ghana, but I still have more pictures and stories to share. I’m happy to be able to share with you a timeline I made of a year in the life of Pastor John. It’s an interesting window into the life of a nucleus farmer in rural Ghana. Pastor John with a collection of his parishioners after his Sunday service. Pastor John Mulnye is one of the most inspirational individuals I met in Ghana. I stayed with him for a total of almost three weeks in Gindabou. He had an amazing work ethic and continually impressed me with the selflessness of his work: he would help other farmers to improve their technique out of a desire to help his fellow man, and helped to run 13 different farmers’ groups for the same reason. I spoke with Pastor John on Christmas Day, and he’s doing well. He’s working to create a world of opportunity for his family and his entire community. EWB is likewise working to create and enable opportunity in the countries that we work in in Africa. I’m one of hundreds of EWBers this season who shared a dream as part of EWB’s fundraising campaign, Imagine 2036. I discuss my dream for the world that I want a child born this year to see as he or she leaves university to enter the world. Please take a look at the dream here and, if you would like, make a contribution to help EWB continue its work. I’m just $150 away from my goal of $1000 with two days left, and every little bit helps! I was inspired to write this after reading EWB co-founder Parker Mitchell’s blog post about The Myth of Sisyphus here. I think that I’ve been struggling a bit with both questioning my beliefs and not having a large enough boulder to push uphill since returning from my placement in Ghana this summer. While there, I had time to dig deeper into who I am, and the results were not the most pleasant to see. I have returned to a reduced course load in order to enjoy what are now my last two years of my undergraduate degree, but I found that the extra time just led to uncomfortable questions: is engineering really “right” for me? What sort of impact can I have as an engineer? Will I not just be a cog in a giant machine, rushing to fulfill the desires of the populace, particularly the rich? Not being at the grindstone meant that I had more time to think these uncomfortable thoughts. I thought that getting away on outdoors trips would make me happy. But I find that the feeling of not having a strong purpose in life prevents optimism in the future, and makes it hard to be happy. I’ve also thought at times that happiness is not something that can be achieved if one seeks it out, but rather something that will come to you if you are working hard and selflessly. I think there is a balance there, but I am not sure where it is. These days, I am not even sure what I should be aiming for in life anyway: to find something that I enjoy and do it? To find something that is of most benefit to the world, and do that? I keep thinking of the “What I’m good at, what I enjoy doing, what the world needs” framework. 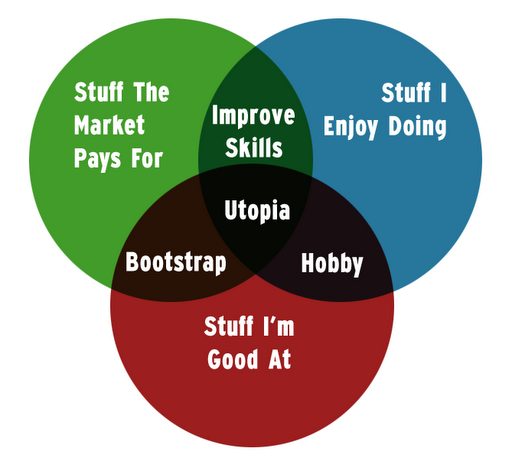 Apparently I’m not the only one who has thought about this, because I found this nifty Venn Diagram showing basically what I described, with “what the world needs” replaced by “what the market pays for”. And, to be perfectly honest, I’ve thought about that as well, though I often feel conflicted as to whether considering this is shallow and counterproductive or simply a pragmatic move. My wonderings have traversed the space of this diagram. I reached an interesting point this spring when the area manager of the company that I was working on a co-op term for brought me into the boardroom to discuss a future with the company. He had heard good things about me from my supervisor, and would be happy to see me come back. He was disappointed when I told him that I would be taking an extra year to finish school, but I came away from the meeting confident that if I wanted to, I would have a perfectly good consulting engineering job waiting for me upon graduation. In many ways, I felt like I enjoyed some of the technical aspects of the job, and I was competent in my work. But really, what I struggled with was a fourth circle (maybe you can imagine four intersecting spheres with the intersecting volume as utopia now? Maybe I am meant to be an engineer….) that represented contribution to society. How will the work I am doing improve the world? I feel like many engineers enter university hoping to use their skills to better the planet, but later discover that jobs that will actually pay them are in the extractive industries. So I realized that this job was not what I wanted. I want to feel like what I am doing is changing the course of humanity’s progress (now that sounds a bit ambitious). In my pondering time, I’ve realized that I only have one life to live. I don’t want to look back in sixty years and regret taking the conservative, the safe path. But knowing I want to do something meaningful and exciting is not enough. Now I need to find out what this will be for me. The grindstone is getting larger, and giving me a bit less time to ponder things. But I feel that I have lost some of the motivation that previously allowed me to work endlessly on schoolwork and extracurriculars. I’ve become cynical about whether our world is actually “developing”, and if it is, whether it is developing in a positive way. I find myself deeply questioning many of the foundations of people’s beliefs, but I do not have a foundation for my own yet. I have also realized that some of my unhappiness is likely due to spending less time with my classmates, and more time alone pondering. Luckily, I’ve signed up for some salsa classes, the UBC ultimate club, and the Sustainability Fund Committee – on top of positions in the Varsity Outdoor Club and Engineers Without Borders. Hopefully, all of this will allow me to reflect more positively on my life. Or maybe it will just mask my fears and uncertainties under a once again hectic lifestyle. Last week was busy as I tried to wrap up some reports and finish trainings at work. On Thursday I began working in earnest with a co-worker to develop a tracking spreadsheet for the bulk fertilizer purchase I’ve been working on. It was one of the first engineering-esque tasks of my work, though it was really more accounting-like. Working with Mohammed on the spreadsheet was important, but frustrating at times. At one point, I returned from giving him a task to test his understanding to find him sitting there with a calculator, which was pretty frustrating. On Friday, I traveled to a community at the edge of the district to run another training on the bulk fertilizer savings program. Again we had farmers indicate how they bought fertilizer, what they farmed, and when they sold their crops by allocating stones between 4 categories representing different options (eg, choose between crops such as: maize, sorghum, yams, and groundnuts). It was cool to see farmers get involved and debate what was grown in their villages. When I got back from the training, I tried to finish up the spreadsheet with my co-worker, but time was short. I had wanted to spend my last day in the village, Saturday, on farm. Instead I spent six hours at work trying to figure out the spreadsheet and details of the fertilizer subsidy program with my coworker. I felt this meeting was highly necessary, especially as a walk-through of the steps of the program revealed some pretty big gaps in understanding. However, it was classic Tom to leave it to the last minute. When I got back to my village, I washed my clothes and it began raining. There was some amusement at the fact that my clothes would not be dry before heading south for my debrief early the next morning. It was hard to say goodbye to the village, especially Kojo, whom I have bonded with quite a bit during my stay. I think I saw tears in his eyes as I headed off on the back of my co-worker’s moto in the morning. Since arriving in Cape Coast, I’ve had some awesome relaxing time at the beach, and also been able to contribute to my team’s learning and direction through feedback. I’ve also taken some time to finish some reports which will hopefully extend the impact of my work. One interesting discussion last night was around the development sector. My coach pointed out that in Ghana, the development sector is somehow where easy money can be made. This can result in those who just want to make money entering the industry, which is quite frustrating. He also spoke about incentives and accountability. In development, there is a strange situation where the people giving money to donor organizations cannot actually see the work on the ground. The implementing agent on the ground may not do good work, and then may give rosy reports to the donor agency. Even if the donor agency suspects the reports are not entirely truthful, it is incentivized to pass the rosy picture on to its donors. He described this as “honour amongst thieves”. I’m now about to board my flight to Canada, and look forward to a few days of re-integration sessions before heading back to Vancouver. Well, due to a combination of horrendously slow internet and a very busy last week at work, I am only now posting a lot of what I wrote almost a week ago now. I am at a resort sitting by the Atlantic Ocean as I write this, preparing for my team specific wrap up meetings (today (Monday) and tomorrow (Tuesday)) and then the whole Ghana JF in-country debrief (Wednesday – Thursday) before we head to Accra Friday and fly to Toronto for a few days of re-integration sessions. Then, one week from today, I will be back in Vancouver! As I said, my last two weeks were pretty hectic. There were some highs and lows, and definitely a healthy dose of reality. This is my first busy day at work. I am scheduled to finish up my first deliverable, a report on credit issues associated to the Northern Rural Growth Program that I had observed in meeting with representatives from rural banks, NGO staff, and MoFA staff. I lay out an outline in the morning before having a meeting with another staff member of the NGO that is facilitating the project, ACDEP, around noon. In the afternoon, I start the report, and then take the time to go and meet with a bank manager at the local branch of another rural brank that has just expanded to Bole. I try to sell him on coming out to a planning meeting for a fertilizer purchasing program on the following Tuesday – he is tentative (in the end, he doesn’t come). I return from meeting with the bank manager and get down to work. I finish up a draft of the report and send it off to my coach, Ben, for feedback. I then go out and exhibit extreme indecision as I struggle to decide whether to buy more fabric. I want something that looks nice – and is made in Ghana, not China. In the end, I look at a lot of fabric before declining to buy any. I then manage with some difficulty to find the tailor’s shop that is making my shirt and trousers, hoping to have them also make a few more shirts, but they are too busy due to Ramadan. I manage to track down another tailor, and he agrees to make a few shirts for me, including shirts for my brother and father. I hope that these turn out to be the right size – the measurements were passed over the phone, and my brother simply stated that he is the same size as my father. I head back to the office (it’s now past 8PM), respond to the feedback and finish the report before emailing it out to various people. I bike back to my village in the dark, which is a bit of a harrowing experience with huge trucks passing on the road which is completely devoid of lights. The village is dead silent when I return and head to bed at midnight. I sleep in after staying up late the night before. I then head to the market with my host mother. She is from Bole, and we go to greet her father before making our way through the market. I buy a number of ingredients for groundnut soup, as well as some for mashed yams and sweet carrots – I am excited to try to cook for my family. I also scout for the ingredients necessary for baking soda and vinegar explosions, but am unsuccessful in finding film canisters and baking soda. After a long wait for a lorry, we return to the village, where I find baking soda (I think – they call it “cow” but it certainly behaves a lot like baking soda when mixed with lime juice). Unfortunately, my improvised film canister for the baking soda and lime juice explosion – a rubber stopper carved from a discarded battery – does not work. I play in the sand with the children for a bit before checking out the maize grinding mill. In the evening, I show my family and some others pictures of Canada, followed by pictures of me in various places in Europe and Israel. They are most interested in the pictures of their village, which makes sense upon reflection – I am also most interested in those places – and more importantly, people – that I have at least some experience with. This is the day that I decide to get a woman’s perspective on life in the village. I don’t start right at dawn, and the first act – participating in washing the pots from the night before – is difficult. However, I am able to explain to my host mother what I’m interested in doing, and I’m able to get a day of scrubbing, helping women to prepare a traditional mud roof, and carrying water in. Carrying water on my head. Note the water on my pants. Carrying large amounts of water on your head is very difficult, and by the end of the day my head and neck are sore from the journeys to the borehole. It is interesting to get to know some of my host sisters better. I realize that the women in my host family, especially my host mother, have it easier than a lot of the women in the village – she does not go to farm, nor does she fetch water. I also prepare a tasty meal of mashed yams and sweet carrots for my family, based on rough recipes from my parents passed over the phone. I am happy when my family enjoys the food, which I suppose is not too surprising based on the amount of sugar and margarine in it. I see first hand how farmers can refuse to follow the advice of professionals as I tell my host father that he should remove some cashew seedlings that he is to plant from the plastic bags in which they’ve been shipped before planting them. In the end, it takes a visit from two MoFA staff members to his farm to convince him that this is indeed the case. I manage to cut my thumb with my Leatherman, which hinders my attempt to learn how to do my laundry properly. My biggest learning from observing my host sister and making a weak attempt to help her wash: there are two wash cycles, not just the one that I normally do. Thinking more about washing and fetching water has me eager to talk to my parents and grandmother about their experiences with fetching water and doing laundry by hand. It certainly gives me a lot of respect for the huge amount of work billions of women across the world continue to do. Monday, August 13: Is This a Cartoon? While staying late to finish preparing for a presentation, I call the second in command at the office to tell him I will drop the office key off at his house. He proceeds to tear me apart for ten minutes for staying after government hours at work. He says I shouldn’t try to make it look like I’m working hard, and warns that if anything is taken from the office after hours I will be blamed. This conversation is made even more frustrating by the fact that the connection is not that great and the man is difficult to understand. Five minutes after this conversation, I manage to break the main key to the office in half while trying to bend it back into shape to insert it into the lock. I am eventually able to solve this problem, and don’t stay quite as late as I did on the Thursday. However, everyone is asleep in my host family’s house when I return, and I feel a bit guilty when I wake people up to eat my dinner, which was still hot. In the morning, I run the training for the bulk fertilizer program I have been working to prepare for the following year. The meeting goes alright, but stretches on. This is tough, because the Muslims (which almost everyone is) are fasting. Once we get down to just the agric officers (there is an incentive in place for officers to arrange shipments, and we decided it was best to not discuss this money in front of the farmers), there is a heated argument over a detail of the incentive: should the directors receive a commission on each bag organized so that they all receive the same, or should they be paid a commission only on those bags that their agents organize? Mr. de Clercq argues strongly for incentivizing the directors by only paying them for bags that their agents organize. Mr. Ibrahim argues this would be unfair to directors whose areas don’t purchase as much fertilizer. And Mr. Aze is most strongly opposed – this competition would crush people’s spirits, he says. Mr. de Clercq emphasizes that this will allow measurement of performance. Aze questions whether this will be performance over the years, or current performance – he is about to retire this year. Mr. de Clercq points out that paying for performance is what is done elsewhere, especially in the private sector. And Mr Aze fires back that this is not a corporation – this is the civil service. People will just work hard because they are supposed to work hard. I don’t really buy that one. At the end of the meeting, I pay out 5 GHC to each attendee for lunch money. I then hop into a tro and head up to Wa, a two and a half hour journey, and meet with a fertilizer supplier there, Emmanuel. Dealing with Emmanuel is quite different than dealing with MoFA. He pays a taxi to bring me to his shop. During our meeting, I lay out some suggestions for him and his business, but I’m not convinced that he is particularly interested. However, he does promise to visit Pastor John and Mohammad to see about fertilizer shipments for them (Mohammad will organize the large shipments to Bole through this programI am organizing). I feel like I am able to listen to him and adapt my recommendations somewhat to his feelings and preferences, but I’m still not sure how much he will do. However, I get a boost of confidence when, after taking me to a guesthouse on a scooter, he gives me 50 GHC – more than enough to cover my travel expenses to Wa, my room at the guest house for the evening, and my dinner. I had wanted to spend the night at Pastor John’s house, which is about an hour away, but he advised that I stay in Wa to avoid traveling at night. The silver lining on this was that Wa has good internet. Unfortunately, it was lights out at the hotel, but in the end it didn’t matter because I was so tired from my journey that I fell asleep just after my computer ran out of battery anyway. I would love to continue this update to bring you closer to the present day, but my computer has 3 minutes (2 now) of battery left and I want to at least get something off. I will update you soon – the internet here is ok. I travel a long ways to meet with a few rural banks in Lawra and then Nandom, which is almost at the border with Burkina Faso. Again, I am impressed with how friendly the workers at these banks are – they would all be happy to share their knowledge with each other. The trip takes much longer than I had expected with waiting for tros, and I don’t return to Wa until past 8pm. I finally end up hopping on a lorry headed to Kumasi to get back to Pastor John’s house in Gindabuo – and pay 13 GHC instead of 3 GHC due to taking a transport that is going much farther. I am greeted with open arms by Pastor’s children. My coach, Ben, is coming to meet me, and so we agree to either meet in Wa, Gindabuo, or Bole depending on timing. In the morning, I travel to Sawla, a town about an hour south of Gindabuo, to meet with the district director of agriculture and observe Pastor John’s fertilizer dealing. I learn useful information about how the NGO working with MoFA on the Northern Rural Growth Program actually runs meetings to bring all stakeholders in the district together to collaborate to secure credit for farmers, allowing all actors – tractor service providers, fertilizer sellers, buyers of the crop, and farmers themselves benefit from assured markets and additional economic activity. I also observe first hand the type of inefficiency that large bulk orders would eliminate: the fertilizer I saw being delivered to Pastor John’s house is offloadedfrom tractor trailers in Sawla at the MoFA office before being loaded into a “Moto-Kia”, or three wheeled transport truck, for transport to Gindabuo and other locations. This adds to the cost, and slows things down, but is easier logistically than organizing many consecutive drops from one truck – especially for the driver of the large truck. I also learn an interesting tidbit – while Pastor John and his farmers had their credit approved, the money has not yet hit their accounts. This means that if I had been able to organize a purchase, and Emmanuel had trusted my word that Pastor had the money in the accounts, my coach and I could have been on the hook to the tune of 8000 CAD if we were to ensure that the supplier was paid. At the time of writing, I’m still not sure if the money had hit Pastor’s accounts. Update: the money was disbursed on Monday the 6th, so Ben and I may not have had to stick our necks out too far. 1) Successful savings and bulk fertilizer purchasing program for the Bole District next year. We were unable to organize a bulk shipment this year, but it looks like next year there could be a good opportunity to organize savings for farmers and then group purchases directly to their village. On Tuesday the 14th, I will be running a session to figure out what this will look like. 2) Linking Pastor John (nucleus farmer) and Emmanuel (fertilizer supplier). As two successful businesspeople who stand to benefit through collaboration (more business for Emmanuel, cheaper and more timely fertilizer with less hassle for Pastor John and the farmers he works with), it would be great to link these two and start off a productive relationship. Unfortunately, both are busy people, and have different working styles, but I hope I will be able to arrange an in-person meeting, hopefully before I leave. Pastor John is busy this week, but perhaps next week will work (I’m crossing my fingers and trying to contact Emmanuel). 3) Linking farmers with Wenchi Rural Bank. This year, the Agricultural Development Bank turned down every farmer that applied for a loan through one program and is dragging their feet a huge amount on another group of farmers. There is the possibility of switching farmers over to Wenchi Rural Bank, which is more eager to lend to farmers, especially through a certain program that is just getting rolling in this district. 4) Provide useful feedback on credit issues to implementers of NRGP, the Northern Rural Growth Program. Meeting with all these rural banks, I’ve been able to have some insights into some sticking points for farmers as they try to access credit. While I feel I have not learned a tonne, my coach pointed out that often information is not presented in a clear and concise way here, so that even a few simple suggestions or observations clearly laid out and presented to the right people could have a positive impact. Credit was identified as the number one risk factor for the program by a MoFA staff member I spoke to, and I will be submitting a report to him with my findings before he heads out to review the program in various districts, raising my expectations somewhat for potential impact. 1) Bulk Order Business Model and how I developed it, to be added to EWB’s AVC Team’s collection of business models as well as posted on a Market Facilitation discussion site on the web where it will hopefully spark some discussion. 2) Credit Observations, to be passed along the implementers of the NRGP program in line with impact number four above. 3) Notes on Credit Mechanisms, which will be added to the AVC team’s playbook to help future JFs and APS quickly understand different ways of assessing groups and different modalities of credit: minimum balances, commitment fees, etc. 4) “Learn from my mistakes” – A few short stories of some mistakes I’ve made, such as not keeping in better touch with Pastor John and missing out on a fertilizer order from him, to try to help future EWBers overseas avoid similar mistakes. During my meeting, I admit to my coach that I think I’ve realized that my dissatisfaction with the state of the Western world – overconsumption, environmental degradation etc. – is such that I am more excited about changing the way people in developed countries live, rather than helping people in developing countries live in a way that uses more resources and abuses the environment more. I guess my placement pushing to increase access/usage of fertilizer put me right up against the impact of increasing consumption and industrialization in developing countries. In retrospect, I think this feeling was due to a lack of real connection to the people I’ve been working with. More on this soon. I also realize the extent of evaluation problems when my coach points out that NGO projects have no incentive to gradually stop holding people’s hands as the program phases out to see who is able to stand on their own two feet and who needs help. While it seems obvious that easing out of a situation will allow you to ensure more groups succeed in the long term, it will result in poor numbers in you last few years as some groups fail and require assistance to address issues. So instead, NGOs are incentivized to maintain maximum assistance until the end of a program, after which point it won’t matter whether the group sinks or swims, because no one is measuring. This made me angry, but also got me thinking hopefully – and questioning – about Cash on Delivery aid, where money is disbursed after results are obtained. Would it solve this problem, or just exacerbate it? I guess it all comes down to the design and implementation of the measurement. I say goodbye to Pastor John and his family as I head off to try to visit more rural banks. I break into tears as I say goodbye potentially for the last time to the family that I have grown closest to so far in my time here. I travel to Wa, but upon arriving contact the bank that I was to visit in Girapa, about 90 minutes away, only to find out the manager has traveled. I feel stupid for having traveled just to find this out, and after unsuccessfully searching for another meeting, I turn around and get a lorry back to Bole. On the tro, I bond a bit with the boy sitting beside me, showing him some pictures of Canada and talking to him about his plans to study geography. It is not the first time that a chance encounter with a stranger has cheered me. When I return to Douli, it is a happy homecoming – it is great to see everyone again. I had planned to take a vacation this weekend, but I realize there will be a big trade-off between integration and this vacation. I also realize I’m out of clean clothes. I decide that I will go to farm in the morning with some of the boys before deciding what to do in the afternoon. I head with my host-brothers to get fresh milk in the morning. It is interesting to see how they treat the cows, which makes me feel a bit guilty about the milk I buy. I am disgusted by ticks along one cow’s belly. I then head back and wait as the milk is prepared. In the mean-time, I construct a device to hold a can in a fire, in order to demonstrate a cool trick of science: atmospheric pressure crushing a can that was full of steam and then cools. I get excited about this possibility. I also make some flip animations for the kids in the village. I decide not to take a vacation, at least not this weekend – integration will be much better (and I don’t have any clean clothes). In the afternoon, I go with my brothers to their farm. The rice area is too wet, so they will only watch for monkeys. I convince one to take me to my friend Kojo’s farm. I go and help him harvest groundnut before we eat a delicious meal of beans at the farm. As I head around with the boys, I have some important realizations. First off, none of them want to be farmers. They prefer school to the farm – all of them. Before, I thought that Kojo had told me that he preferred farm to school, and I could sort of see why – it was physically active work and there were cool fruit to see along the way (in retrospect, pretty weak reasons, though logical to me coming from a desk job in Canada where I found myself frustrated at times with an environment that was the same everyday regardless of what nature threw at us). I realized that my host brothers do not like going to farm – their father forces them. I realized that an immensely important freedom is the freedom to choose your career. Associated with this is the importance of everyone being able to get the training they need to pursue their passion. Writing this now sounds somewhat stupid, but I think in many ways that this is really what a lot of development is about, and one of the greatest parts of a country like Canada – anyone can study up to a university level with the help of student loans, bursaries, etc. I would hate for this to not be the case, but I could now see clearly that this was not the case for many of the men – and women – in the village. I would like to have some conversations about what people feel about farming, and possibly what they would have preferred to pursue if given the chance. I also realize that I view two children’s rights as hugely important: the rights to play and learn. At one point, I think as we were on the long walk back from the farm, surrounded by maize and then savannah forest, Kojo asks me if he can come to Canada. I’ve received many of these requests, and usually they frustrate me. They draw attention to the fact that there is great inequality in the world, but I’m not able to sponsor these people to come to Ghana. This time, it’s somehow different. I feel like I’ve really bonded with Kojo. He tells me that when I return to Canada, he will come with me. I tell him that it won’t be possible. He tells me that he doesn’t know the meaning of possible, which sort of breaks my heart. We talk about it more. I think I tell him half-heartedly that it’s very cold in Canada, a line I picked up from a friend. He tells me that he has discussed it with his father, and his father says that if I agree, Kojo may go. I ask if his father understands that he would not return, and he says yes. Again, this pulls at my heart. I feel this speaks directly to the inequality between Canada and Ghana. Even if Kojo did not finish high school in Canada, if he became a citizen, he could work at 7-11 and make more money and likely live better in terms of food, entertainment, and living conditions than he would in Canada. I told Kojo that I can’t bring him with me, and that even if I was allowed it would be way too expensive – at least $1000 CAD, or around 20,000,000 old Ghana cedis (the old currency is used with large sums) – for him to fly over. That is more than a motorcycle – a good one – costs here. He tells me he will take a car, and I have to explain that that is impossible. I ask him why he wants to come, and he explains that it’s just because I am here in Ghana and I am from Canada, which again is touching. I explain that if he studies hard and does well in school and university, it is possible that he could pursue graduate studies in Canada. He tells me later that I should give him my contact in Canada, so that when he finishes his senior school and is ready to enter university he can call me and I can arrange for him to come to Canada. I have to explain to him again that it would be prohibitively expensive – even 10,000 CAD per year. I find myself wondering about the chances of me being successful enough in 4 or 5 years to support a Ghanaian university student in Canada. As I write this, I realize that international fees would likely roughly triple that 10,000 CAD. But maybe there are scholarships? Kojo continues to be the person I feel perhaps most comfortable with in the village, and he even brought me some honey from the bush the other day, in addition to lending me a pen when one of my host brothers took mine (I suspect). I feel this is genuine, and am starting to think that Kojo could become my Dorothy – the person who motivates me to work harder to improve conditions around the world so that people have the opportunity to better themselves and their communities. He continues to ask about going to Canada – last night he said he would just stand on the way there, and they would not charge him anything. I wish it were that simple. I have a great day with my host family. I decided I wanted to spend an entire day on the farm, to really experience what it feels like to work all day. So, I headed to my host family’s farm (after leading a yoga session (which has since become a daily routine) on the concrete pad where the chief prays). My host brothers and the chief were weeding rice, and I happily joined in. After some bug bites, I retreated to my bag and applied some insect repellent before continuing. Weeding with my host brothers and their father (grandfather for one) was a great way to get some insight into the boys’ daily lives. One, Adam, would stop working whenever his father looked away (which his father noticed and complained of). The chief drove his sons quite hard, and I could tell they were not happy to be spending their day in the fields. One boy went to buy some fresh milk with some money I gave, and everyone was happy when he returned at roughly the same time as one of the chief’s older wives and his youngest daughter arrived with lunch. After lunch, the chief (who did not eat due Ramadan) went to weed a bit more before returning to the village. His boys joined him, and so did I. When he prepared to leave, I said I would weed a bit more – but his boys implored me to call it quits, because they would have to work as long as me. So we finished a small bit that we were working on and headed to rest under a tree. At this point, I wondered if I should move on, and join my friend Kojo at his friend’s farm to really get a full day of farming. There were some logistical issues with this (I had no idea where the farm was), but it may gave been possible. Instead, I decided I should stay with the boys and really walk in their shoes for the day. I had already not done my laundry, instead passing it to my host sister to wash as the boys to (I felt less guilty about this because I plan to spend an entire day with the women in the village to get their perspective before leaving. Incidentally, my clothes feel a lot cleaner than they usually are when I wash them….) This turned out to be an excellent decision. The boys went to bath in a small creek running through their farm, which I initially felt somehow awkward about watching. But it was them dunking themselves under a small waterfall (probably 3 feet tall), and horsing around. After they had jumped around the small pool of water, they said they would practice jumping, and did practice jumping back and forth from side to side of the small, five foot wide canyon. It was beautiful to see the boys being boys and just playing. I joined them in a bit of the jumping, and then we all climbed a mango tree where we all watched some of the videos on my camera. After this, we went fishing. The fishing was only slightly successful – my brother caught a small one that we tosed back in – but it was good to just relax with the boys. As we were finishing fishing, two of the boys got into a pretty serious fight, throwing each other down on rocks, which injected a bit of reality into the situation. In some ways, I failed to spend the entire day at the farm. But really, I succeeded in getting to know my host family a lot better, including the fact that my host father was a welder/fitter (fitter basically means mechanic) when he was younger, and has travelled to Accra and Kumasi before. I wake up and write down some goals for the last few weeks of my placement – only 8 or 9 days of work left – and lead another yoga session before biking to work. At the top of the big hill into town, wanting some protein, I buy two frozen chocolate malt bars (which, after looking at the nutritional information, are exactly the same as the much more expensive fresh chocalate milk). It is a tough day at work as I feel scattered, trying to contact too many people and do too many things. I find out my favourite co-worker, de Clercq, has travelled and will only be back for 3 days before heading back to university next Wednesday, which sort of shoots a hole in a number of my plans. I am able to talk to him and discuss a training that we need to run if the bulk fertilizer ordering program I am helping to kickstart is going to be successful next year – and he says we will need to pay people to attend, in addition to buying them lunch. Frustrated, I turn to a coworker and ask her how much I will need to pay – and she says that usually the workers are paid 50 GHC each, which is about a sixth of what the lowest paid make in a month. That’s definitely out of my price range, I tell her. She asks me whether my program has money, and I say no. I then make the mistake of telling her that my daily stipend while here is less than what I would make in an hour in Canada. She tells me that I’m wasting my time here. After this, things pick up. My coach pledges to finance the beginning of the program, probably out of his own pocket, and de Clercq agrees that we can probably get away with just providing lunch to the workers, not lunch and T&T (time and travel?). Ideally, we would not pay anything – workers would see it as a business opportunity and would come if interested, and this would allow interested extension officers to self select. De Clercq frankly tells me that attendance must be mandatory – if given an option to not attend, AEAs will take it. I think of all the events I’ve attended just to eat pizza (too many to count), where I’ve had no interest in the subject matter. I hope the training next week will not be like that, and will instead be like some of the productive meetings I have been to that have had food provided as a bit of an incentive, but more as more of a thank you and necessity than the main reason for attendance (though I guess in most cases it depends person to person what one’s motivations are). De Clercq believes that if the meeting goes well, people will be able to take up the program without further assistance, which is exciting. In the evening, I stay late at working preparing the first bit of this blog, and then bike back home. In the village, buy some of the local brew, pito, from Kojo, whose mother brews it. I sit and drink, relaxing. I give Kojo some money to buy fish for a meal that I will eat tonight (Tuesday night) at his house). I don’t find any small bills, so I give I have to deal with more people asking to come to Canada, which is always a difficult one. I eat, sharing some of the local beer with my host family. I then learn a small amount more of the local language – I have completed 4/10 of the modules and may now say N yeling Dagaare bela bela (I speak Dagaare small small). I arrange to eat dinner the next day with Kojo’s family, and head to bed completely exhausted. I’m able to get some useful work in the village while I wait out some rain, compiling a number of questions and then calling up a credit manager who is currently at school. I head to work, where I stumble upon a cool conversation with an NGO worker over the phone as I try to get someone else’s contact info. At lunch, I’m able to extract some useful info from the manager during his lunch break, and then I launch into finishing up this blog, which takes longer than I’d expected (as it always does). Right now I’m debating whether to add a few pictures, and wondering whether I should head to work tomorrow or spend the day getting to better understand the lives of the women in my village. I’m also wondering whether I should stay at work late to talk to this credit manager again after he gets off of school, or whether I should head and get some cloth I bought yesterday tailored into a suit. We’ll see. Overall, it feels like all of my impact right now is up in the air. I’ve got to make a number of things happen in the next week and a half if I’m to actually change anything here, which is both exciting and scary. Time to go from the beautiful, potential, hypothetical, to the cold, hard, and sometimes disappointing reality of trying to make change happen. I hope it works out. It’s been brought to my attention that my latest blog post got emailed out to everyone, despite being password protected. I just meant to send it to my coach, Ben, who will look through some details about it to see how appropriate they are – whether names should be mentioned, amounts of money used, etc. As soon as he reads it over, I will un-password protect it for all to see. In the meantime, I have had a rough couple of days in terms of stomach issues, but it seems like things are clearing up now. I am headed to go and meet a few bank managers today before heading down to meet up again with Pastor John, a nucleus farmer I met earlier this summer. In the future, I will try to avoid this confusion by emailing drafts out or making them “private” instead of “password-protected”.